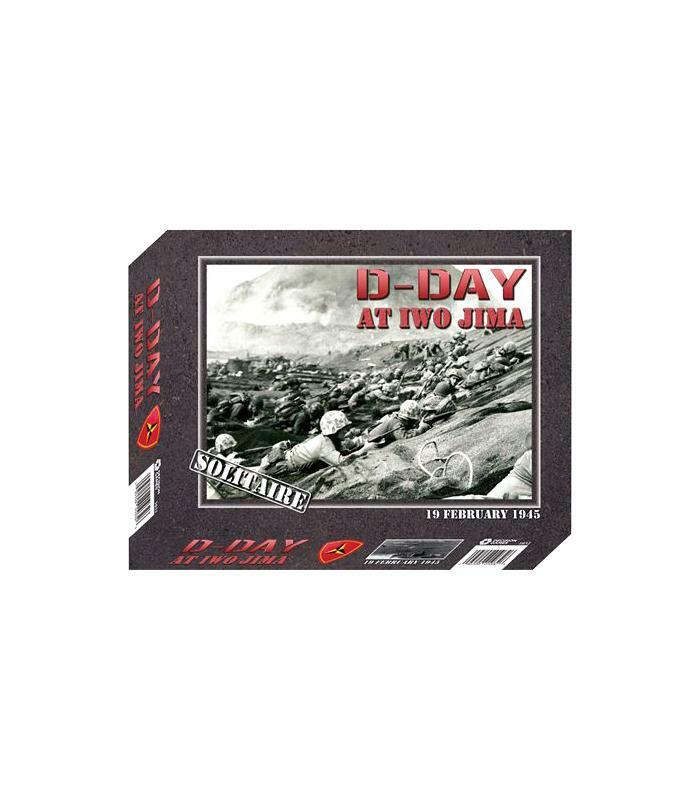 D-Day at Iwo Jima is a solitaire game simulating the amphibious invasion of Iwo Jima. The 5-week Battle was some of the bloodiest fighting in the Pacific. In one of the costliest intelligence failures of the war, the planners had completely misjudged the situation that would face the Marines. The beaches had been described as excellent and the advance inland was expected to be easy. Instead, the Marines were faced with 15-foot-high slopes of soft black volcanic ash that brought the normally rapidly moving Marines down to a slow plod. In addition, the lack of a vigorous response led the Marines to believe that the bombardment had completely suppressed the defenses. However, General Kuribayashi was far from beaten. Understanding that his forces were insufficient to defeat the massive American invasion force, he had decided to defend the Island in-depth. In D-Day at Iwo Jima, designer Joe Youst builds on John Butterfield’s award winning Solitaire Game System. 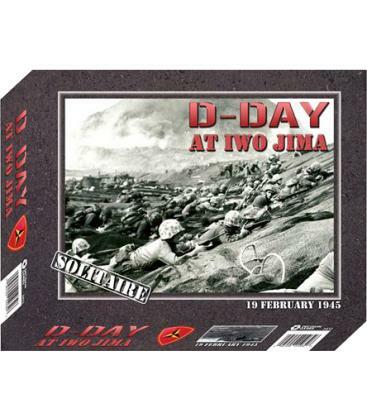 The player controls 3 US Marine Divisions against a determined Japanese defense. 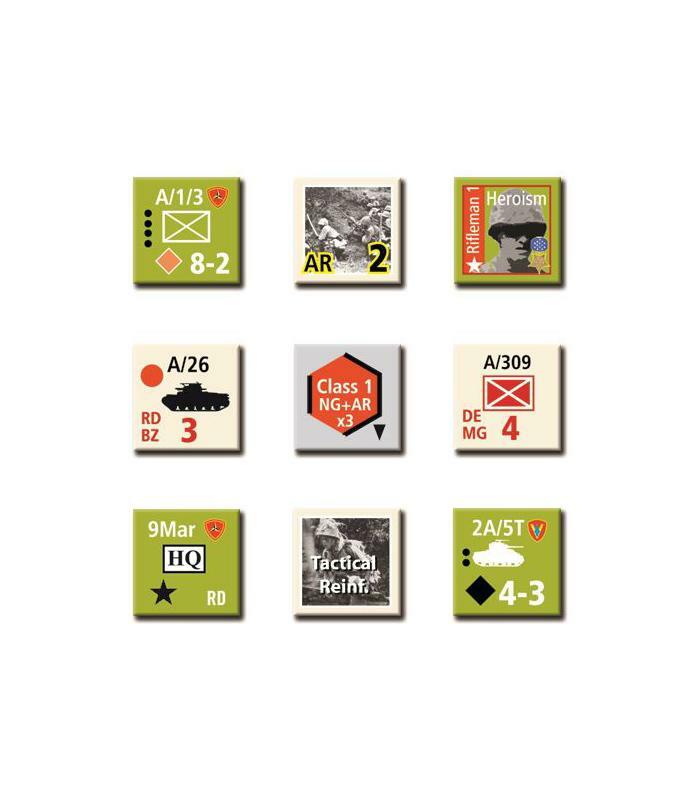 The no-dice combat system highlights the unknown enemy deployments and coordination of the right weapon systems and tactics. Players familiar with the previous 3 games in the system will be able to quickly set up and play this latest version. New features include a random fortification generation system that simulates the ability of the Japanese forces to "re-fortify" supposedly weakened positions and an updated infiltration system that encourages the player to maintain a continuous line. 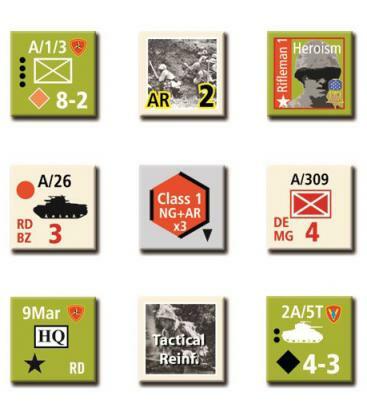 D-Day (19 February) – Covers the first day in 6 turns. Surabachi (20 to 24 February) – The 28th Marine Regiment’s capture of Surabachi. Drive to the North (20 to 24 February) – The attack on Airfield One and advance by the 4th and 5th Marine Divisions. Hot Rocks (25 February to 4 March) – The attack to clear the Motoyama Plateau. Drive to the Sea (6 to 10 March) – The final attack on the plateau and the end of organized Japanese resistance. 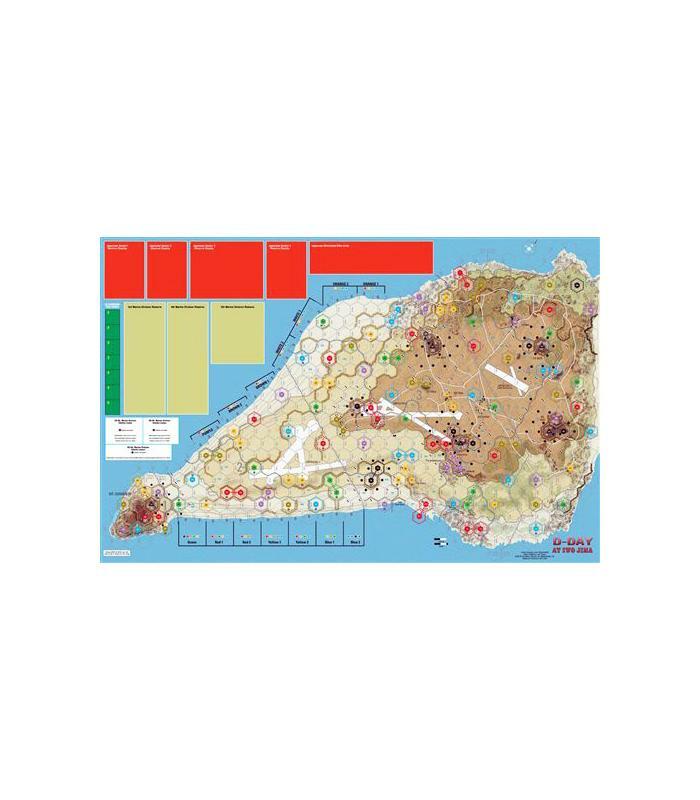 Sands of Iwo Jima Campaign (19 February to 11 March) – The Campaign combines all aspects of the previous Scenarios into one look at the entire Campaign. Contents: 528 Die-cut Counters, One 34x22” Mounted Game Board, One 11x17” Set-Up Map, Player Aid Cards, Color Rules Booklet, Color Campaign Analysis and 55 Event Cards.